Emil Gammeltoft: "My Secret Nazareth Audition"
Emil Gammeltoft, guest singer on the Fighting Demons album, has told of his "secret audition" as a lead vocalist for Nazareth. Here is an exclusive interview with Emil. Background: Emil's audition took place on the 5th of October 2013, following the retirement of original vocalist Dan McCafferty in late August. However, a couple of weeks after Emil's audition, illness in the band resulted in cancellation of all Nazareth live performances. No further auditions could therefore take place until February 2014. 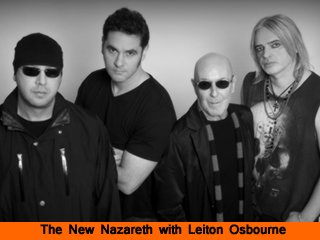 Eventually, on the 22nd of February 2014, the band introduced the 41 year old Linton Osbourne as the new lead singer for Nazareth. In the official announcement Nazareth stated that "his (Linton's) enthusiasm and energy has been a shot in the arm for the band, and a real boost after the keen sense of loss and sadness at the sudden retirement of our dear friend and brother, Dan". Retired Nazareth vocalist Dan McCafferty has also given his blessing on the appinment, who was pleased to hear that a "local lad" has been choosen as his successor. We recently had the pleasure of meeting up with Emil, and got to ask some questions about his audition. Q: Not only performing with the Nazareth rock legends, but actually audition for the lead singer spot. How did you cope with the occasion? First and foremost I couldn't think on coming there to audition as replacement of the best rock singer ever in the world, Dan McCafferty. If I should have thought about that too much it would have ended me sitting and shaking in a terminal in Amsterdam. Having said that, I did drop a bottle of Irn Bru on the floor before the audition. There is a lot of respect from my side to the boys, but they welcomed me with open arms and it was good to see them. The only person I was scared of was Tam Sinclair (Nazareth guitar tech) who was sitting behind my back in an armchair. Q: How do you feel the session went? It went fine overall. You discover what kind of songs suits the voice better and so forth. My focus was just to deliver vocally and feed off from each other as musicians. Q: What songs did you play? Miss Missery, Razamanaz, Love Hurts, Hair Of The Dog, Bad Bad Boy and Beggars Day. We also did This Month's Messiah, even if that was not planned. Q: What were your feelings at the time, when you stood in front of the mic for the first time? Just to sing some songs with a bunch of great guys. I assumed it was Dan's microphone I sang on but I couldn't think of things like that without dropping another Irn Bru, so I didn't. Q: Which songs would you have liked to do with Nazareth, if you had the choice to perform a live gig with them? I would love to do Revenge Is Sweet and Gimme What's Mine. I also would love to have a go at Claim To Fame and Go Down Fighting as my vocal pitch suits those songs. However, the main reason to join Nazareth would be to perform new material as they seem to release new music every third year nowadays and not being a nostalgia act. Both The Newz and Big Dogz do have some really great songwriting so I would look to the future. Q: What are your feelings on losing out on the lead singer slot? I do not see it as "loosing out" and I respect their decision fully. 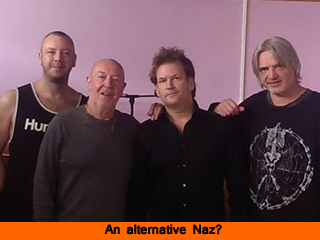 Nazareth is a Scottish band so the logistics of having a local person is easier. I also wanted them to test different vocalists as Nazareth are worth only the best of the lot. Besides, now I can finally focus on my Swedish projects, and possibly some exciting new happenings with The Fluffy Jackets. Q: Presumably, the job would have changed your life quite drastically. Did such issues or other things (apart from musical & artistic issues) play a part in your case? Initially, I was almost in a cloud worrying about my daughter, and the fact that she would see me much less if I were to be offered the job. However, after a couple of days I felt that I would have said yes if they asked me. I think it would have worked out fine. Q: Did you meet Linton and do you have any messages to him going forward? I did not meet Linton but I hope to meet him later this year, when Nazareth starts touring again. I have only good things to say to him and wish him the absolute best of luck. Emil Gammeltoft is a guest singer on our debut album Fighting Demons, which is out now. As of March, Linton Osbourne has left Nazareth, quoting on his Facebook page "it did not work out - for me or for the band". Persian Risk frontman Carl Sentance has since been appointed his successor, making him the 3rd vocalist in Nazareth's long career.